Hubsan H109S X4 Pro Review – Explore the World and Record It! Is Hubsan X4 Pro Worth Buying? What are the Pros and Cons? H109S X4 is the first professional drone produced by Hubsan. The company is known for designing amazing toy drones such as the Hubsan H107D+ X4 and the Hubsan H501S X4. In fact, they have had a wide success in the toy drone category, Hubsan H107 drone series is one of the most sold in the low-cost drone market. After such big success, Hubsan aimed for a more professional product, thus releasing the powerful and yet affordable Hubsan H109S X4 Pro. For all the camera lovers looking for a neat FPV explorer drone with a long range, strong endurance, and great camera, Hubsan X4 Pro might just be the best bang for your buck! 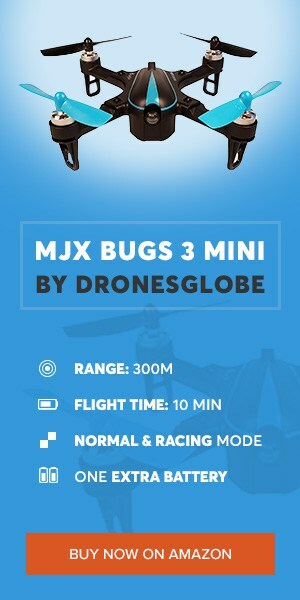 Without further due let’s review this affordable drone which already is available in the market. Hubsan H109S X4 Pro is a camera drone. You will be able to get 1080p High Definition aerial footage without any hassle since the camera is remotely controlled. X4 Pro comes with a 3MP 1080p HD camera produced by Hubsan itself, the action camera is safely placed on a 3-axis stabilized Gimbal that can be remotely controlled through the transmitter. Why is it such a good drone for recording aerial video or taking photos? Well, besides the HD camera, this 3-axis gimbal has a -/+ 145º horizontal rotation shooting which offers a broader Field of View (FOV); a -/+ 45º automatic rotation (whenever the X4 Pro is tilted to ensure smooth footage); a 65º to -125º straight down shooting, offering the best angle from above. On top of this, Hubsan X4 Pro also transmits live video (5.8Ghz frequency) directly to a FPV (First Person View) screen built-in on the remote controller. We will discuss the remote controller further on. Right now, it’s important to mention that you don’t need anything else to fly FPV right out of the box. Hubsan X4 Pro comes with all you need, including this controller with a built-in live video monitor. As you can see, if you are looking for a drone with a nice camera to record all your adventures in the outdoors, either a day at the beach or park or even a sporting event, X4 Pro is ideal for it. As expected from a quadcopter branded as professional, Hubsan H109S X4 Pro comes with a wide set of important and useful features. First, and to ensure you don’t lose or break this amazing drone, Hubsan has built a Parachute Emergency System. If anything happens and the drone suddenly drops from the sky while flying, a parachute will immediately open, ensuring the drone doesn’t break or get lost. Hubsan X4 Pro also has Altitude Hold (drone maintains specific height while pilot focuses on the video or photos), Headless Mode (easier orientation despite where the front of the quadcopter is pointing at), GPS Position Hold (drone has a built-in GPS which allows accurate position/altitude). On top of all this, Hubsan X4 Pro is also able to automatically take off and land, ensuring smooth landings and easy takeoffs from anywhere. Besides this amazing drone features, the 2.4Ghz remote controller also packs some unique functions take make X4 Pro even more unique! Such functions are: Flight Telemetry (real-time flight data displayed on the screen), Gimbal Control (remotely move the gimbal, acquiring different recording points of view) and of course Waypoint Presetting (slide your fingers, set the waypoints). Waypoint Presetting allows you to plan a route, therefore making the aerial photography and videography much easier and simpler. The very affordable Hubsan H109S X4 Pro comes with all you need to fly FPV right out of the box, and on top of that it also includes features that you will find extremely useful and very intuitive. As I previously said, this drone is ideal for exploring and recording outdoor video. Specially if this is your first drone. Not only it will simplify flying, but you will be able to get hassle free footage. Use it to record your best moments. Now let’s discuss the specifications of Hubsan H109S X4 Pro. One thing which worries many pilots looking for an explorer drone is the flight time. Well, don’t worry. Thanks to Hubsan X4 Pro large 11.1V 7000mAh Li-Po Battery (takes around 90 minutes to charge), you will get 20 to 25 minutes of flight time. Slightly above the average flight time for drones within its price range. However, if you add an extra payload to the drone, the flight time will obviously reduce. Our tip is to buy 1 or 2 extra batteries, therefore when the first runs out you always have a second if you still need more time to record video, take photos or explore in FPV (real time video transmission) some area. However, we advise you to wait around 10 to 15 minutes between battery changes, this will allow the motors of the drone to cool off. If you keep changing batteries and resume flight right away, the motors might overheat and damage the quad. Wait 15 minutes, place the extra battery, keep on flying! Another very important aspect of an explorer drone is the control range. Well, as mentioned previously Hubsan H109S X4 Pro is a long-range drone. You can fly it as far as 1km, past eyesight! But don’t worry, the live video transmission range is also 1km, so even if you lose sight track of your drone, you can still know where it is by watching the real-time video transmission displayed on your screen. THE GOOD Hubsan H109S X4 Pro comes with all you need to fly FPV right out of the box. It’s a long-range drone (1km), the battery has long endurance (25 minutes). Camera is 1080p HD (real HD). Flight data on-screen (GPS status, range, speed, height, remaining battery power, quadcopter position (latitude/longitude)). Impressive speed in Altitude Hold mode. X4 Pro also has an important and useful set of features such as Headless Mode, GPS, Automatic Landing and Takeoff. For the pilots that concern about safety, worry not, X4 Pro includes a Parachute Emergency System that prevents the drone from crashing and breaking. THE BAD FPV built-in screen on the remote controller is a bit small. Parachute weighs 200gr, if you want you can detach it to increase flight performance and flight time. BOTTOM LINE Overall, Hubsan H109S X4 Pro is a great value for your money. An affordable drone with good quality hardware and software. It delivers what it promises without any doubt. The FPV screen could be bigger but the drone is also compatible with FPV Goggles in case you require a wider angle of view. If you are looking for a camera drone for your outdoor adventures, Hubsan X4 Pro is a very nice fit! It is not the easiest to carry drone out there in the market as it’s somewhat of a large drone. However, if you want a great drone for a very affordable price, you will love Hubsan X4 Pro! What did you think of our Hubsan H109S X4 Pro review? Have you been looking for an explorer drone with a 1080p HD camera? Furthermore, do you seek a drone that includes a good set of features? Well, Hubsan H109S X4 Pro surely ranks among the best. Are you considering buying one? If you think this is not the drone that best fits your needs feel free check other drones within the same price range on our Top 10 Drones Under $500 list. Let us know what you think in the comment section below, we at DronesWorld.net love to read all your comments and answer to your questions and doubts. Happy flying fellow drone lovers!